Twin - $ 1,299.00 Twin XL - $ 1,499.00 Full - $ 1,699.00 Queen - $ 2,099.00 King - $ 2,199.00 Cal-King - $ 2,199.00 Few Left! Wake up refreshed and relaxed! The Jasmine offers cloud-like comfort, deep contouring, pressure relief, and reduced motion transfer. This mattress adjusts to your body with the ultimate blend of support and comfort. The cooling effects of a copper-graphite infusion allow you to sleep at a comfortable body temperature. The Jasmine’s layers and materials create a luxurious sleep experience for side sleepers and those who prefer a softer feel. 3" Copper-Graphite Infused Memory Foam - The top layer is pillowy soft memory foam with a copper-graphite infusion. The conductive power of copper works to keep you cool by drawing heat away from your body, while the antibacterial properties keep your bed clean and fresh. 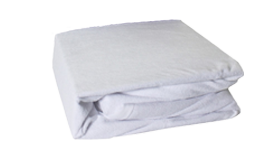 2" Memory Foam - The next layer of memory foam molds to your body and provides gentle support for pressure points. This layer allows you to sink in a little deeper into the mattress, giving you a feeling of cushioning, like you’re being hugged by your bed. 2" Transition Foam - This layer provides the final transition to the bottom layer. These extra layers of cushioning are perfect for creating our softest sleeping experience, perfect for those who love to sink into their mattress. 6" Base Support Foam - The foundation layer is high density, providing structure and durability. Thanks to this layer, you’ll have many more years of enjoyment from this mattress. The top layer is pillowy soft memory foam with a copper-graphite infusion. The conductive power of copper works to keep you cool by drawing heat away from your body, while the antibacterial properties keep your bed clean and fresh. The next layer of memory foam molds to your body and provides gentle support for pressure points. This layer allows you to sink in a little deeper into the mattress, giving you a feeling of cushioning, like you’re being hugged by your bed. This layer provides the final transition to the bottom layer. These extra layers of cushioning are perfect for creating our softest sleeping experience, perfect for those who love to sink into their mattress. The foundation layer is high density, providing structure and durability. Thanks to this layer, you’ll have many more years of enjoyment from this mattress. Try out your new bed hassle-free for up to 120 nights! Try out the TRU Lite bed to make sure it’s right for you. We’re so confident you’re going to love it, that we’ll give you 4 months to try it out! Why so long? We’ve found that it takes a while to get used to a new bed after you’ve been sleeping on a different mattress. Your body needs to adjust, because at first any new bed might just seem weird. Give yourself that time to try it out. Once you’re used to it, then you’ll know if it’s right or not. Our mattresses are made right here in the USA using the best quality materials available. We believe in our product because of the personal care we’ve put into every step of the process. It’s been designed, stitched, and crafted with great care and pride. All of our mattresses are backed by a 10 year, no-hassle warranty. Side sleepers and those who prefer gentle support for their pressure points love the TRU Lite Jasmine. All foams used in the TRU mattress are CertiPUR-US® Certified, which means that they meet rigorous standards for minimizing off-gassing. Our mattresses use no harmful chemicals such as formaldehyde, ozone depleters, heavy metals and certain flame retardants that may cause cancer and genetic defects. All foams meet the standard of fewer than 0.5 parts per million VOC (volatile organic compounds). Your perfect pillow hunt is finally over. Naturally Hypoallergenic and hyper - responsive. Our pillows promote a healthier sleep. The Best Sheets Ever are crafted with a simple formula: the “just right” thread count at the “just right” price. Finally an affordable, powerful adjustable base that ships right to your door. You need mattress protection to keep the dust mites and germs embedded deep in the fabric from disrupting your family’s sleep. Twin - $ 899.00 Twin XL - $ 999.00 Full - $ 1,199.00 Queen - $ 1,299.00 King - $ 1,699.00 Cal-King - $ 1,699.00 Few Left! Twin / Medium - $ 1,199.00 Twin / Soft - $ 1,199.00 Twin / Firm - $ 1,199.00 Twin XL / Medium - $ 1,299.00 Twin XL / Soft - $ 1,299.00 Twin XL / Firm - $ 1,299.00 Full / Medium - $ 1,499.00 Full / Soft - $ 1,499.00 Full / Firm - $ 1,499.00 Queen / Medium - $ 1,799.00 Queen / Soft - $ 1,799.00 Queen / Firm - $ 1,799.00 King / Medium - $ 2,199.00 King / Soft - $ 2,199.00 King / Firm - $ 2,199.00 Cal-King / Medium - $ 2,199.00 Cal-King / Soft - $ 2,199.00 Cal-King / Firm - $ 2,199.00 Few Left! Twin - $ 1,499.00 Twin XL - $ 1,699.00 Full - $ 2,199.00 Queen - $ 2,299.00 King - $ 2,799.00 Cal-King - $ 2,799.00 Few Left!